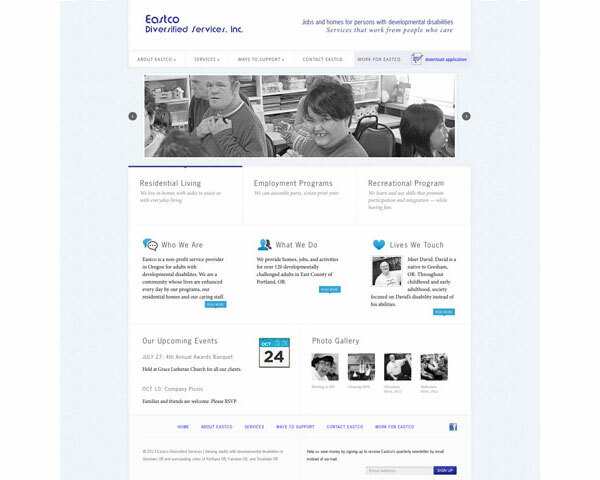 As a non-profit organization, Eastco helps adults with developmental disabilities. The organization’s website needed to showcase their broad spectrum of programs and touch upon the human services aspect to the audience. In my preliminary Discovery Meeting I learned their biggest obstacle was finding good employees and retaining them. Which is why the “Job” application link became part of the site’s main navigation. Another challenge of this project was developing content that best described their programs in their business model. Resolutions was thrilled to accomplish these tasks and to work with such an amazing organization in Gresham, OR.